So far I am so glad I made the decision to change to Marine and look forward to ups and downs that will no doubt come my way. Clowns are comical mine often just lay there in the host coral. The wiggle dance is generally the male that wiggles submitting to the female. 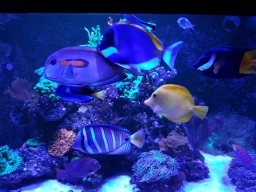 You say they spend a lot of time at the thermometer as you possibly don't have something in there they can host like and anenomie, torch coral, frogspawn ect they have chosen the thermometer and they have also been known to host powerheads or a particular corner of a tank they are comical. I'm not sure the age of your system and coral stock if any but as it matures and you add corals they may then choose to host one. Thanks for the information my tank is only a couple of months old. What you say makes sense as I moved the thermostat one day and they shifted over there .. I don't have many corals in the tank at the moment but will add little by little. If you do get say an anenomie (make sure it's bigger then the clowns ) or something like the a torch or frogspawn if you then remove the thermometer for a few days chances are they will move to a coral or an anenomie.